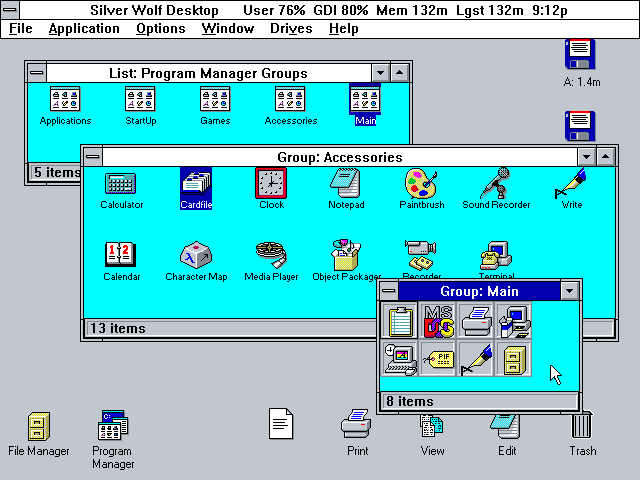 Silver Wolf Desktop is a shareware desktop shell for Windows 3.1. 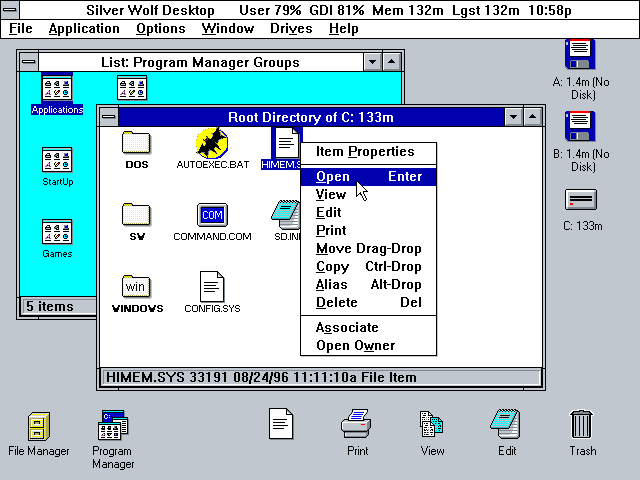 It is similar to the Norton Desktop or PC Tools for Windows, in that it gives Windows 3.1 a somewhat Mac-like user interface, but not as full featured. 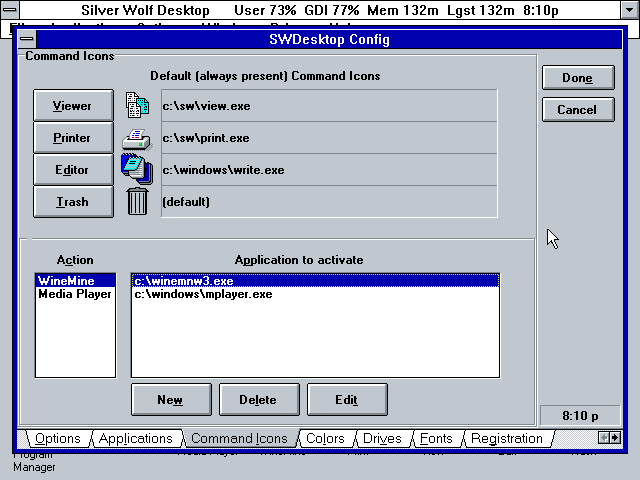 In Silver Wolf Desktop drives are visible directly on the desktop, each folder opens as a window, and files are represented by icons. Program Manager groups are also given individual windows. You can right click on objects to access a pop-up menu that contains items for applicable common actions. 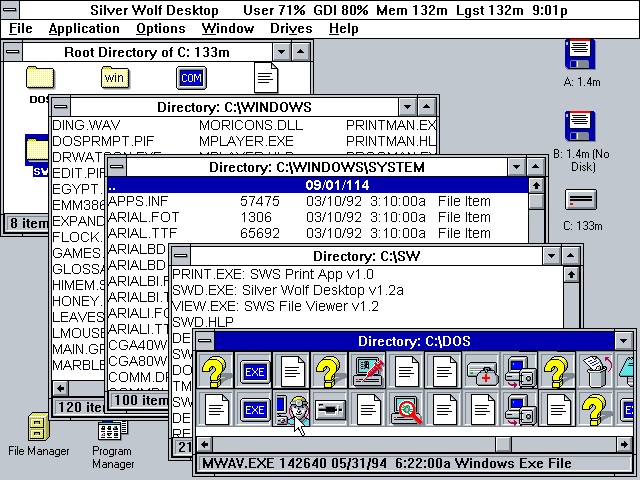 Silver Wolf Desktop has 5 different folder views: As Icons, Text, Long Names, Text and Info, and "Buttons". The "Buttons" view is kind of odd for file folders. This view consists only of icons with no text. It is really intended for use with program groups. Icon View displays EXE's icon resource as the icon. It also uses an application's icon for associated document types. Each program group opens in its own folder window. You can save and restore the desktop, but this only includes which windows are open, not how icons are arranged. 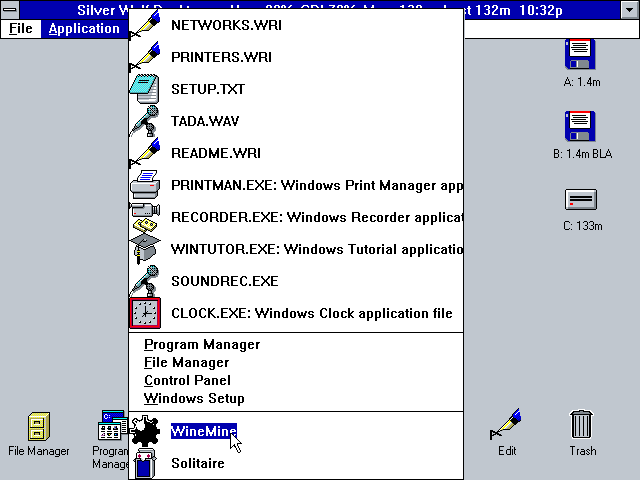 The "Application" menu shows a list of the ten most recently used applications or documents. You can also add your own permanent application items to this list. It is possible to place application icons on the desktop, but not with the usual drag-and-drop. You must add them through the configuration dialog. Even then, they will always appear automatically arranged along the bottom of the screen each time you start the desktop.